The other day dawned here in Berkeley, California with low, clinging fog. It was like being in the middle of a cloud. The thing about this kind of weather is that it’s rare—and wonderful—to have the water droplets in the fog physically on myriad objects. Truly, they look like nature’s perfection, and it is paradise photographing delicate plants and the webs of spiders when these gentle fog drops stay put. Mostly, this is in the autumn when spiders begin to spin their webs in earnest. The kids, as always, were up early, and so was I. When I noticed the wondrous fog, I threw on some clothes, gathered my camera with a Zeiss 50mm f/2 macro lens, put an extension tube in my pocket, and headed up the hillside to hunt water drops on spider webs. My thought was to look for out-of-focus patterns in the light reflecting from the fog droplets on a spider web, with the term bokeh covering the general rubric of attractive out-of-focus photography. Clearly, the Zeiss prime lenses are very sharp. But one thing that is less obvious that I also love about these lenses is how well they render out-of-focus areas. 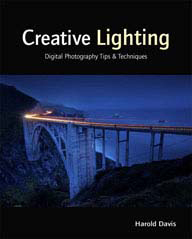 As I advise in Achieving Your Potential As a Photographer: A Photographer’s Creative Companion and Workbook, it sometimes enhances a photographic quest to set technical limits. So I decided to only use the maximum aperture on my lens (f/2). Besides photographing wide-open, I planned to use aperture-priority metering, to shoot handheld (as opposed to on a tripod), and to include at least some out-of-focus elements in every frame. 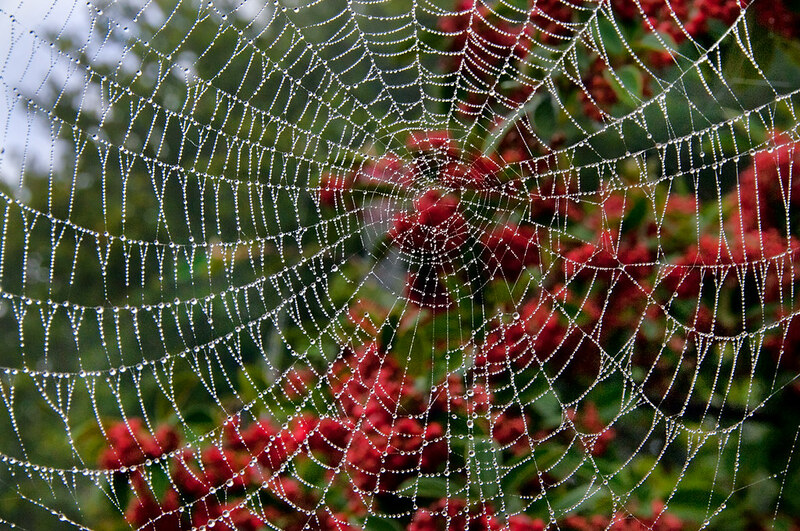 With these constraints in mind, I started finding spider webs covered in morning dew. Bokeh and out-of-focus or not, the background was important to me. I needed a spider web with a clean background without wires, trash cans, or cars. Higher and higher up the hills I went, and just as the sun was starting to burn through the fog and evaporate the water drops, I found a delightful web in great light at the crest of the hills that dominate this side of the San Francisco Bay area. Of course, even with a fixed aperture, and letting the aperture-preferred metering handle the exposures, there were many variables that impacted the bokeh: the focus point I chose, how out-of-focus I threw the image, the directionality of the focus blur, and whether or not I used an extension tube. 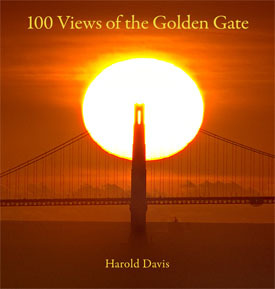 Related stories: Natural Jewelry; Within the Web; Web Architecture; Web Solarization; Nature’s Harp. 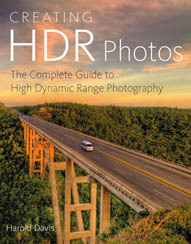 Also check out my book, Photographing Waterdrops. If you’ve been following my blog or my Flickr stream you may have noticed more than the usual proportion of extreme macro shots involving waterdrops. Well, I do love shooting waterdrops in the spring, so maybe this needs no explanation, but it is also because I’m at work on a book about waterdrop photography from Focal Press (the cover is shown to the left). Here’s the story behind a recent shot I made for my book Photographing Waterdrops: Exploring Macro Worlds with Harold Davis. Up early on a cool, drizzly morning I wandered the trails in the coastal mountain range near where I live. It was damp and cool and my major preoccupation was staying warm and keeping my equipment dry. Then the sun came out and the moisture began evaporating over huge swaths of the land. I knew that to capture waterdrops I needed to move swiftly. I lay down on my belly in the rain soaked grass, and pointed my camera on its tripod up at these waterdrops with the sun bursting through. I was careful when I made my exposure to error on the “dark side” by about 1.5 EV—because I knew that I could recover dark areas when I processed the photo, but if let the sunbursts blowout because of overexposure then the primary visual point of the image would be lost. Exposure data: 200mm macro lens, 36mm extension tube, +4 close-up filter, 3/10 of a second at f/45 and ISO 200, tripod mounted. The Paperwhite, Narcissus papyraceus, is a small white flower related to the Daffodil. Grown from a bulb, the plant is originally from the Mediterranean basin. It’s commonly thought of as a house plant—and “forced” to bloom indoors for the winter holidays. By the way, forcing a bulb is a process that to some extent negates the old saw that you can’t fool Mother Nature. The idea is to convince a bulb that it has slept through winter and come into spring—and that now is the time to send forth flowers. This psychological manipulation of the bulb is accomplished by cooling it in a dark place for some time and then putting it someplace warm, such as a sunny window, to experience virtual spring. A prisoner in a dark cell can have their sense of time totally warped in the interests of their captors, and the same thing is true when it comes to bulbs. But I digress, a common thing for me when it comes to flowers. It seems that I have Paperwhites growing without being forced in my garden, and blooming this time of year. I don’t remember intentionally planting them. I think we must have been given a forced Paperwhite in a pot. After it was finished blooming I must have popped the bulb out of its pot and into the garden and forgotten about it, and, voilà, this little Narcissus papyraceus patch in December was the result. How cool is that? In fact, it does not get very cold in my garden. It rarely gets any cooler than 45 degrees Farenheit here in the hills of Berkeley, California—cool enough for the Paperwhites, and temperate enough for me to stay warm even though the garden was wet from a light rain when I photographed these flowers the other morning. Least Popular Posts: I’ve added a neat widget to my blog that displays the least popular posts I’ve ever written. You can see these neglected stories listed about half way down the Masthead on the right, just below Recent Posts. I thought these stories were dead and buried deep. There’s a certain morbid fascination in watching them rise from the blog post grave like the Undead—until some poor, hapless visitor to my blog clicks on them. By the very act of opening one of these stories they become more popular than their peers, and escape off the Undead Blog Story list! When I drop Katie Rose off at Step One, the area around her pre-school is often in the clouds, with drops of water clinging to flora—and spider webs. The other day, I brought my camera, and paused to admire the marvelous but ephemeral architecture of the spiders. There was a stiff breeze, so I shot needed a fairly fast shutter speed. I also needed a bit of depth-of-field to get most of the web in focus. All photographic technique amounts to compromise in the face of what is practical. In this case, I boosted my ISO to 500. With my lens set to a 65mm focal length, I shot at 1/100 of a second shutter speed and an aperture of f/14. This was an underexposure by about 2 EV compared to an average light meter reading—in essence I captured the waterdrops on the web at the expense of letting the colorful background of the out-of-focus tree go dark and dull. As I teased my image out of the RAW file I adjusted this, so that the waterdrops are vivid, and the background also appears bright. There’s nothing like watching rain from inside where it is warm and dry to usher in feelings of sweet melancholy. Yesterday, a warm and gentle rain fell like a curtain of moisture across Berkeley, California. It was too wet to photograph outdoors, but my shutter finger was definitely itchy. 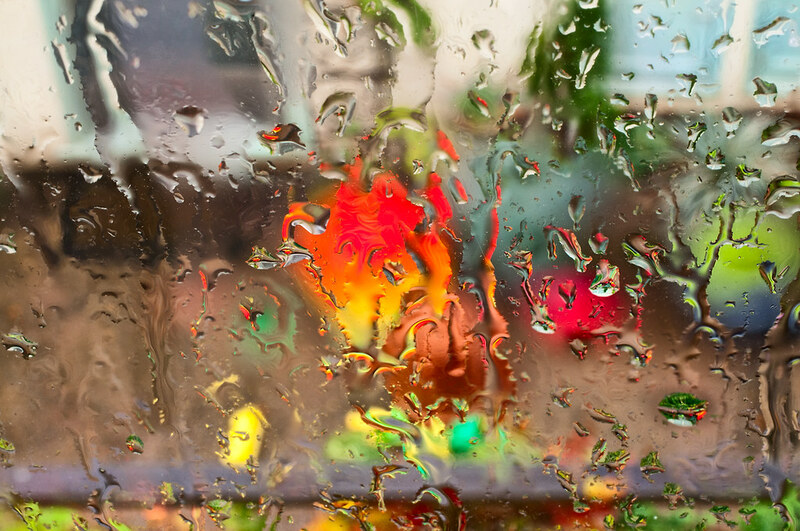 Looking out a rear window I saw the pattern of waterdrops on the glass made fanciful colors from a neighbor’s yard. I shot with my camera on the tripod, combining three exposures to get the depth-of-field right. I used the f/5.6 exposure for the overall background, and exposures at f/14 and f/32 to render some of the waterdrops sharper. 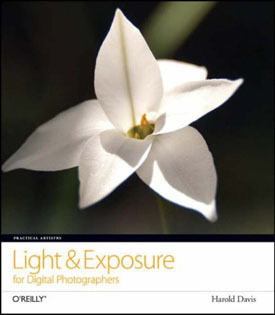 Exposure data: 50mm macro, 3 exposures (1/60 of a second at f/5.6, 1/13 of a second at f/14, and 3/5 of a second at f/32), ISO 100, tripod mounted; exposures combined using hand-layering in Photoshop. The day started with a massive downpour. Then there was a sunny interlude before the rain began again. Things continued in this intermittent vein. I took advantage of a lull in the rain to photograph waterdrops and sunshine (a rarer combination than one might think). Things were moving quickly. My usual approach to waterdrop photography is surprisingly formal, using a tripod and fully stopped-down lens. Today I decided to try a different approach. 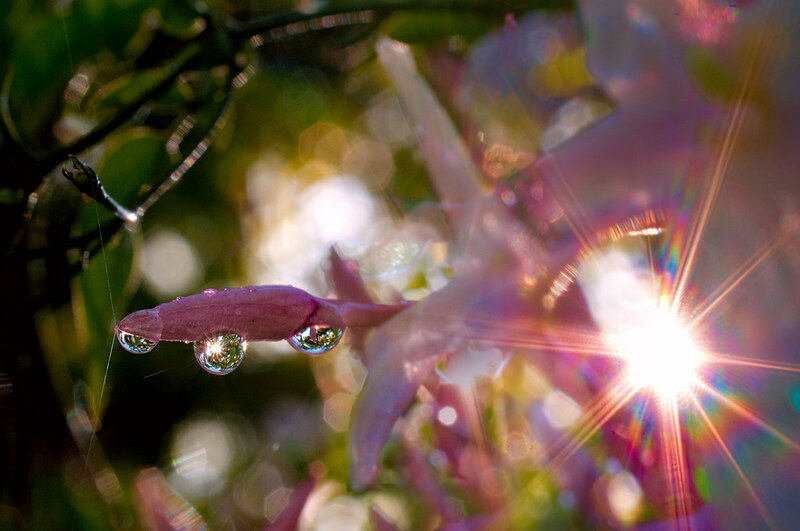 I hand held my camera, focusing on some waterdrops on a clump of flowering Jasmine backlit by the rising sun. Using manual exposure, I made sure to pick a fast enough shutter speed (1/400 of a second) so the waterdrops would be sharp even though they were in motion. Then I focused on the waterdrops and fired off about ten shots. By then, the sun had moved out of the frame. This was the best of the bunch, with the wildness of the solar refractions and rays in contrast to the controlled focus of the waterdrops on the Jasmine bud. Exposure Data: 50mm macro, 1/400 of a second and f/10 at ISO 320, hand held. 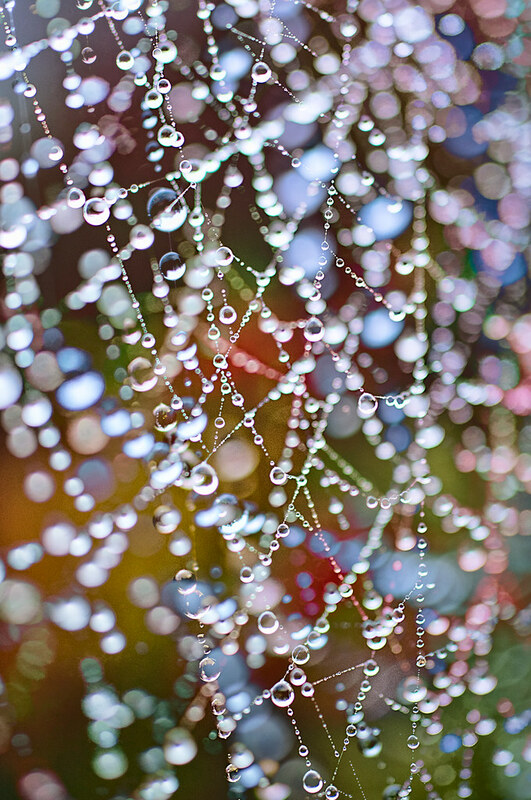 How fine it is to take advantage of a light rain, and photograph waterdrops caught in a spider web! 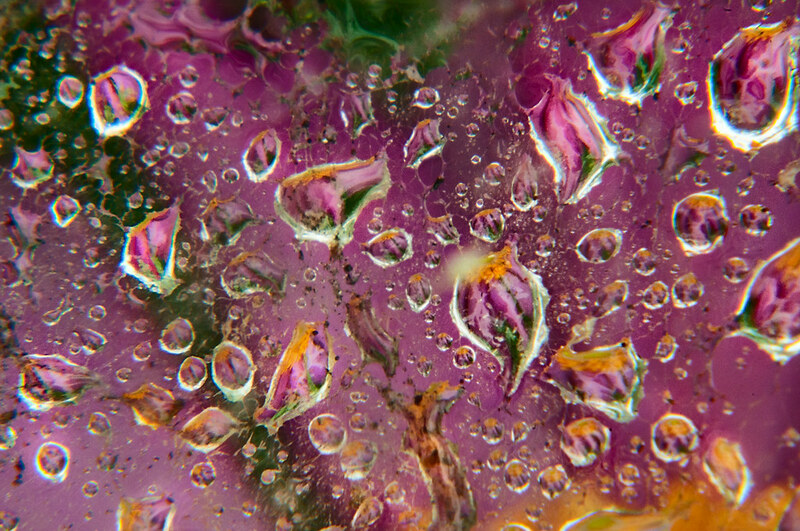 A small, delicate flower, an anemone, is behind the web and refracted and reflected in the waterdrops. 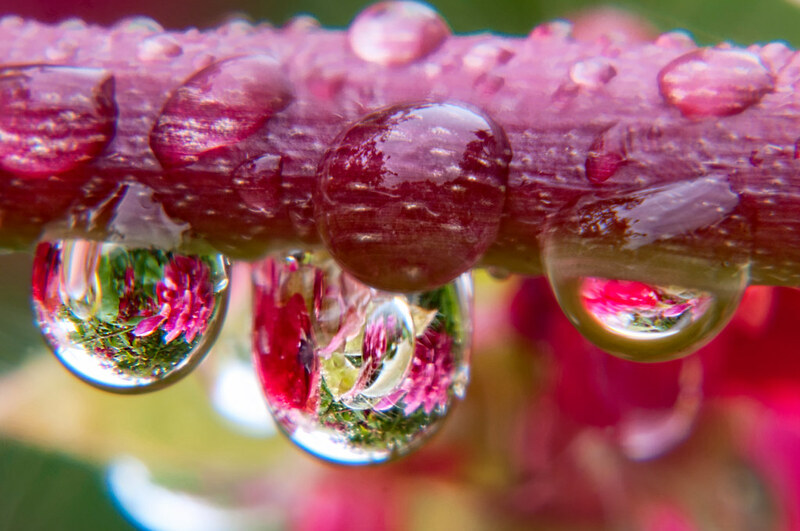 Here’s the Waterdrops category on my blog and my set of Waterdrop images on Flickr. In a photography blog, when you see the word “zone” in the title of a story it is not unreasonable to assume you may be reading about the Zone system—the schematization of the relationship between tonal values in a final print and the exposure range in a photographic subject, first popularized and proselytized by Ansel Adams. But no, the subject of today’s story is a very different kind of “zone”: the feeling that combines, in an apparently paradoxical way, mindfulness and loss of a sense of self when photography comes together right. Athletes, musicians, and visual artists (to name a few) share the possibility of peak performance when they hit this zone. Mindfulness means that you pick up on details and quickly sense compositional and emotional connections. Loss of a sense of self means that you are not thinking about how to sell your photo, or photography competitions, or your kids, and that your sense of time passing has vanished in an ecstasy of creativity. 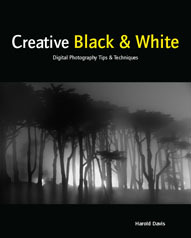 The craft of photography seems innate, and the choices you make with that craft automatically serve your vision. Being in the zone doesn’t happen that often (at least to me), and it is to be cherished when it does. The other morning, photographing following an unusual summer rain storm, the garden heavy with waterdrops and fragrant in the still air seemed in the zone—and so did I.